When you hear the word zeppelin, most people think of the band Led Zeppelin or the Hindenburg disaster. While Mythbusters did prove that a lead balloon could float, the history of zeppelins is far richer. One thing is certain, whether you are a music fan or not, the crash of the Hindenburg is a powerful image in the minds of people around the world. 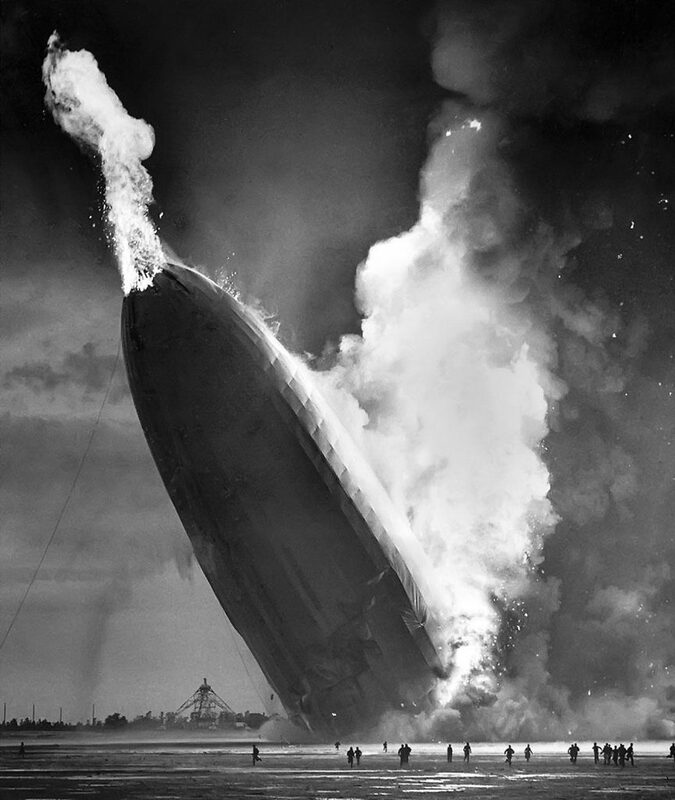 It was May 6, 1937 , 80 years ago, when the Hindenburg crashed in New Jersey proving two things: lighter than air flight with hydrogen was dangerous, and nothing good happens in New Jersey (we’re looking at you, Jersey Shore cast). The crash was caught on film and memorably narrated by Herbert Morrison. Fatalities included 22 crewmen, 13 passengers and one ground worker. While the incident destroyed public confidence in the zeppelin as a mode of transport, those glorious airships have a history that is worth looking at. The zeppelin itself is named after Count Ferdinand von Zeppelin. Count Ferdinand was a forward thinking Brigadier General in the German Army. After he retired from the armed forces, he devoted his time and energy to creating a rigid framed airship (non-rigid airships are called blimps). He started his work in 1874 and by 1895 he had patented the zeppelin in Germany, and in 1899 the patent was filed in the United States. Zeppelin’s designs were so successful that his name was applied to all rigid-framed airships going forward. Prior to the widespread adoption of the airplane, zeppelins were the air transport mode of choice. Deutsche Luftschiffahrts-Aktiengesellschaft (the German Airship Travel Corporation) started commercial flights with zeppelins in 1910, and had carried over 10,000 paying customers by 1914. 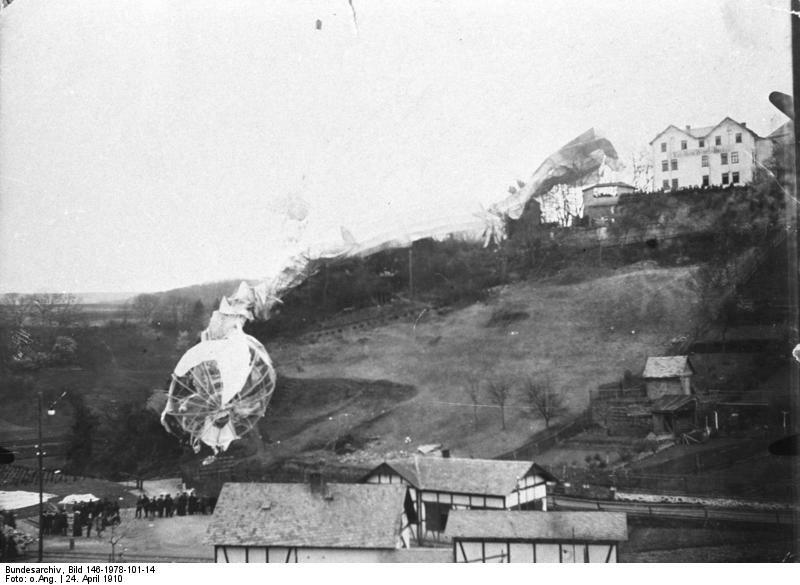 During World War One, zeppelins were extensively used by the German military, both for scouting and in bombing efforts. 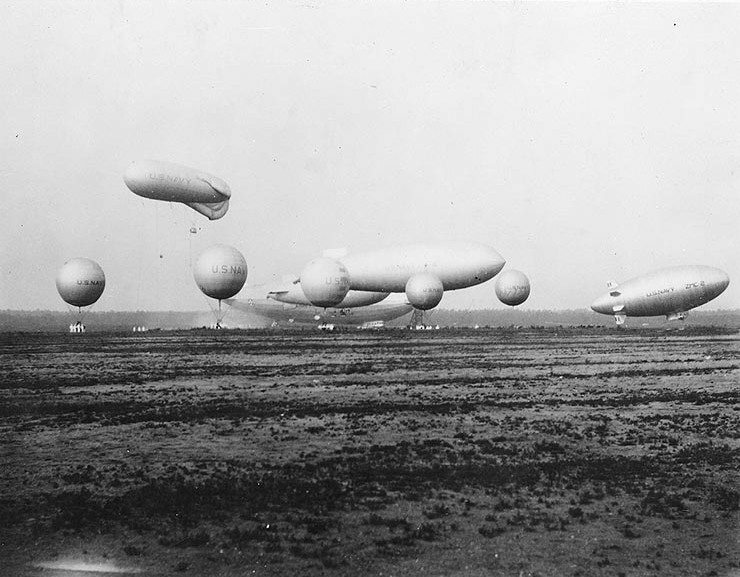 U.S. Navy blimps at the Naval Air Station in Lakehurst, New Jersey (USA), ca. 1930. Image: Public Domain. Germany’s ability to construct airships was severely limited after World War One, and they were forced to surrender their existing airships to the victors of the war. However, the ban on airship construction was lifted in 1926, and work began on the most successful airship in history the Graf Zeppelin. Over its nine-year life, the Graf Zeppelin flew 590 flights; travelled over a million miles; made the first regularly scheduled transatlantic flights by air; circled the globe; and carried a scientific expedition over the North Pole. Over the course of these voyages, the Graf Zeppelin safely carried thousands of passengers and transported hundreds of thousands of tons of mail and cargo. 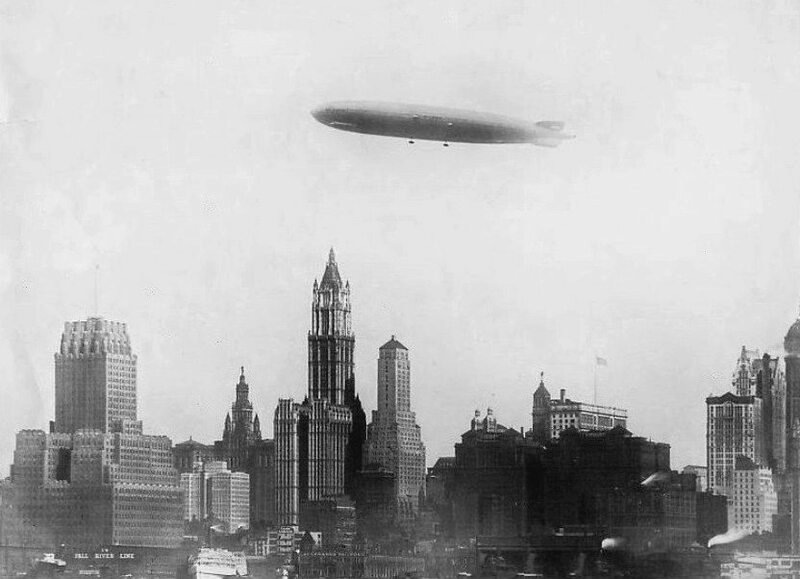 Photo of the Graf Zeppelin I over New York City on its first Transatlantic voyage. The airship made an aerial tour of the city before heading for Lakehurst, New Jersey to land. Image: Public Domain. But not all zeppelin trips were so positive. Due to their huge rigid-framed balloon, these large ships were very vulnerable to winds and storms—especially when close to the ground or when docked. This wasn’t even the biggest risk though. The most obvious risk facing zeppelins was the flammable gas that gave the airships their buoyancy: hydrogen. Hydrogen was cheap and abundant, and it also has a higher lifting ability than helium . Helium however carries a big advantage—it is not flammable; quite the opposite in fact, it is flame retardant. The largest source of helium was in the US though, and when the American government realized the advantage of helium over hydrogen, it limited the export of helium with its Helium Conservation Act of 1925. This meant that German zeppelins used hydrogen, sometimes with disastrous results. Perhaps because it was caught on film, the Hindenburg is the most famous of zeppelin fires, but there were dozens of other hydrogen airships destroyed in similar accidents. All of these disasters contributed to the eventual death of zeppelin-based air travel. While zeppelins were largely absent from the sky for 75 years, the idea and the promise of them never fully died. Some companies, such as Aeros, are applying modern technology to the old idea of zeppelins and airships. With a buoyant gas like helium doing much of the lifting, airships could be an efficient way to move cargo in the near future, and history will once again come full circle.